Our Wall Priest deck list guide for the Rastakhan’s Rumble expansion features the top list for this new archetype. 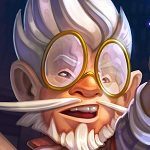 This Priest guide includes Mulligan Strategy, Gameplay Tips, Card Substitutions, and Combos/Synergies! Combo Priest is an archetype built around the interaction between Divine Spirit and Inner Fire (or alternatively, Topsy Turvy). Unlike the Test Subject OTK variant, however, this version (often called Wall Priest) has a lot more board-centric strategy, casting large Taunt after large Taunt until one of them sticks in preparation for the killing blow. 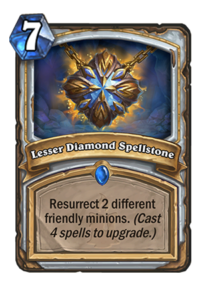 Its post-patch Rastakhan iteration may remind you of Resurrect Priest due to the presence of cards like Eternal Servitude and Lesser Diamond Spellstone, but it is in fact much more analogous with the Combo Priest decks we’ve seen at the end of the Year of the Mammoth during the Kobolds and Catacombs meta. That deck used Dragon synergies, Twilight Acolyte and Potion of Madness to use the opponent’s board presence against them – here, Shadow Madness plays a similar role, the trade-off compensated for by the near-infinite amounts of large Taunts this version can generate. 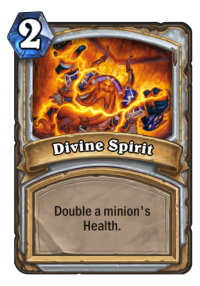 Your goal is to apply multiple copies of Divine Spirit to an already large minion before either buffing it with Inner Fire or flipping its stats with Topsy Turvy, delivering enough damage to kill essentially any opponent in a single swing. 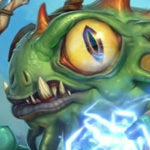 The latest version popularized by Dekkster and Thijs uses Master Oakheart to summon multiple large threats in a single go: the kicker being the inclusion of Mosh'ogg Enforcer, a beefy Taunt that is very difficult to remove through conventional means, and one that can often maintain its high health total even with an opponent having a large threat on the board due to its Divine Shield. While aggressive opponents still pose a considerable challenge – the loss of tools like Duskbreaker, the aforementioned Potion of Madness and Kabal Talonpriest certainly tilted the odds away from you compared to last year’s Combo Priest decks –, the unique opportunity of running two sets of board clears in the form of Mass Hysteria and Psychic Scream give you ample fighting chance in those matchups as well. A notable casualty compared to previous builds is Radiant Elemental, a minion that was essentially omnipresent in the archetype before, providing you with ample cycling opportunity early on and a potential for an early Divine Spirit/Inner Fire push in certain matchups. (The card also plays a critical role in the standard Resurrect Priest decks.) However, it would be both an extremely undesirable resurrection target and a dilution of the Master Oakheart pool, therefore it simply can’t make the cut in this particular version of Combo Priest. As you can probably tell based on the above, a good understanding of the variety of different Priest decks that saw play over the last year and a half will help you greatly when trying to master this one: its gameplay strategy will vary greatly depending on the type of opponent you’re facing, and it’s a very rewarding and powerful archetype that’s well worth figuring out even this late into the Year of the Raven. This is the best and most popular deck list for Wall Priest in Rastakhan’s Rumble. The deck list might still get changed or refined – if it happens, we’ll update it here! Find more versions of this deck type on our Wall Priest archetype page! 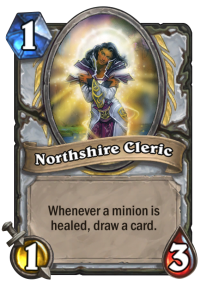 Northshire Cleric and Tar Creeper – Seeing how Wall Priest has very few early-game minions compared to the previous ones, having one of them in your hand early on is essential for your success. It doesn’t matter whether you’re playing against aggro, combo or control decks, not having these cards means it’s a lot tougher to start cycling your cheap spells or even to keep up on the board even against light pressure. While some of the other cards are also very important for your strategy – Master Oakheart springs to mind first and foremost –, none of them are must-keeps considering how they can be too slow against aggressive starts of not impactful enough against certain slower opponents. The section below provides a comprehensive breakdown of these cards. Master Oakheart – While it’s true that the impact and board presence generated by Master Oakheart in this deck almost rivals what it used to do in Taunt Druid, the lack of ramping tools for Priest means it will take you the full nine turns to get it out. As such, you should only keep him on the coin in slower matchups on its own or if you’ve got either Northshire Cleric or Tar Creeper already otherwise. Facing aggro, it’s an iffy proposition even if you’ve got one of the above in yp. Zilliax – Keep it if you expect to go up against an aggressive opponent; toss otherwise. Witchwood Grizzly – Same, but with the added caveat that its lack of initiative means it’s not good enough to keep in your mulligan on its own. It can be kept in combination with Eternal Servitude regardless of the matchup you’re facing though! Even if the original copy is small, the resummoned one will be in all its twelve-health glory, no matter your opponent’s hand size. A word of caution: while it might be tempting to keep Lesser Diamond Spellstone in the ultra-slow matchups, trying to get it upgraded as quickly as possible, you actually want to try and fish for extra copies of it with Shadow Visions against those opponents, therefore you should not keep the card even in those cases. By the same token, Shadow Visions itself is also not a card you want to hold onto during the mulligan: often you won’t even know what you’re looking for just yet – though Divine Spirit should be your primary target – and your odds of picking up a specific spell will be fairly low on turn 2. It made more sense to keep when Radiant Elemental was in the deck as it could potentially fuel an early Divine Spirit/Inner Fire push; however, it’s nothing more than a trap with the current builds of the archetype. Your main win condition against aggressive opponents is to simply outlast them by setting up an unmanageable wall of taunts via multiple copies of Eternal Servitude, Lesser Jasper Spellstone and Master Oakheart. The combo finisher often only serves as an afterthought: using Divine Spirits as a defensive tool simply to make your taunts even bigger is a perfectly viable option. In fact, the same goes for your other combo pieces as well: Inner Fire can be particularly potent against a buffed Scavenging Hyena or anything that survives a Mass Hysteria setup. The two sets of board clears available to you plus the sea of massive blockers means that your chances of winning increase exponentially if you can stem the bleeding during the early few turns. This is a part of why Northshire Cleric and Tar Creeper are so crucial to hold onto: if nothing else, they serve as bargaining chips and trade potential to keep you in the fight. Don’t get greedy: you’ve got so many redundant resources that it’s absolutely fine to use a Mass Hysteria to clear two small minions simply to buy more time. The same goes for the Spellstones. 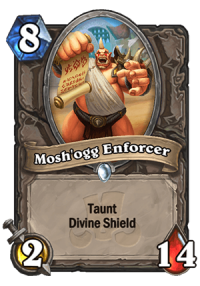 Once something like a Mosh’ogg Enforcer sticks, you’ve pretty much won the game even without the Inner Fire or the Topsy Turvy. These matchups are what you’re hoping to get when you queue this deck on ladder. Try not to overcommit: the fight will revolve around trying to stick one massive minion on the board and going in for the kill with your combo – and since your opponent knows this, you can often force out premium removal just by playing out a single minion. The beauty of these games is that any kind of a board presence can become an opportunity to deal lethal damage at the latter stages of the match: with Shadow Madness and Mass Dispel, you can potentially finish off your opponent without establishing a large minion of your own on the field. If you haven’t got the chance to play it on curve and the game is progressing at a slow place, you might want to avoid playing Tar Creepers in order to make your resurrection pool even beefier. The amount of resources available to you means it’s close to impossible to deny a combo opportunity over the course of a long game – you’ll only need one shot, therefore you essentially have an “extra” combo piece in the form of Inner Fire that you can use a bit more liberally. This is especially true because of the looming presence of Skulking Geist in matchups like Big Spell Mage: if you don’t reserve Topsy Turvy as your ultimate finisher, you can run into trouble. The mirror matches are a special kind of crazy: getting onto the board early can be surprisingly important (especially if you can draw additional cards off of a Northshire Cleric), and Shadow Madness means that trying to set up your own combo will often put you at risk of immediately losing the game on the backswing. Mass Hysteria doesn’t really cut the mustard here, meaning you can commit to the board once you’ve exhausted your opponent’s Psychic Screams. 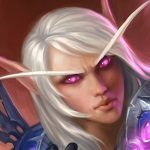 The lack of Shadow Word: Death also means that The Lich King poses an incredibly nasty threat in this matchup – and this is one of the few cases where you can get away with keeping Master Oakheart in your opening hand. While you don’t have much wiggle room if you’re trying to keep the “wall” theme of the deck intact, there are a few cards you can consider swapping out depending on the circumstances. Divine Hymn – A pretty decent anti-aggro tool that’s capable of healing back your taunts after a value trade or two while also recovering a non-negligible amount of health on your hero to limit your opponent’s burn options: however, it’s almost a dead card in other matchups, so if that’s the kind of metagame you’re facing, Shadow Word: Pain is an adequate replacement, especially when you consider how monstrous it can be in the mirror. Alternatively, a second copy of Mass Dispel is also worth consideration. 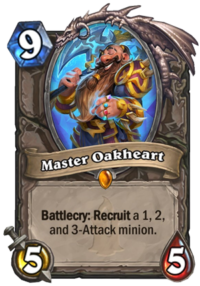 Master Oakheart – While it’s a core element of the deck, it’s understandable if you don’t want to craft it so close to the rotation. If you happen to own a copy of Lyra the Sunshard, it is a worthy substitute even if it comes with a slightly different gameplan. 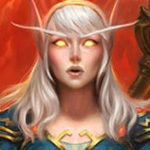 Luci Kelemen is an avid strategy gamer and writer who has been following Hearthstone ever since its inception. His content has previously appeared on HearthstonePlayers and Tempo/Storm's site. Check out Yellorambo on Twitter! Does any one else think that mass dispell makes this deck just broken? Unless you’re playing a super aggro deck. 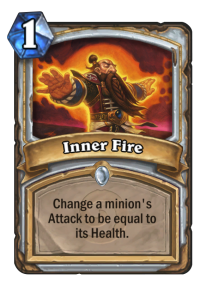 I mean once inner fire is played and dispell is in hand it’s well played. This is also due to shadow visions. I’m just not sure what card is more op, dispell or visions. I feel on of these cards has gotta be nerfed. What y’all think? If I don’t have Oakheart or Lyra, what would you suggest? It’s the only card I’m missing from the deck. Perhaps Obsidian Statue or Ysera? Lorenzeub just posted a smart decklist where he uses a Cloning Gallery to cheat out his enforcers. Barring that, you could try a Shadow Essence with the same goal. As much as I respect the ingenuity behind this deck, I’m REALLY glad this enforcer/inner-fire/rez synergy is only being discovered weeks before the rotation because its not at all fun to play against.